This isn’t going to be pretty. But it’s important. It’s about... this morning. The insistent shriek of the alarm. The pillow marks still on your face in traffic. The overpowering Monday-ness. Let’s see that this doesn’t happen again. Take your first look inside The Sycamore Kitchen, a sunlit haven of coffee, pastries, eggs and sandwiches for the first two meals of the day, finally opening Wednesday. Obviously, you know Hatfield’s. Plenty of elegantly casual dinners there, dates and deals, and popcorn. Good times. But they kept forgetting about all those hours before dinner. Until now. 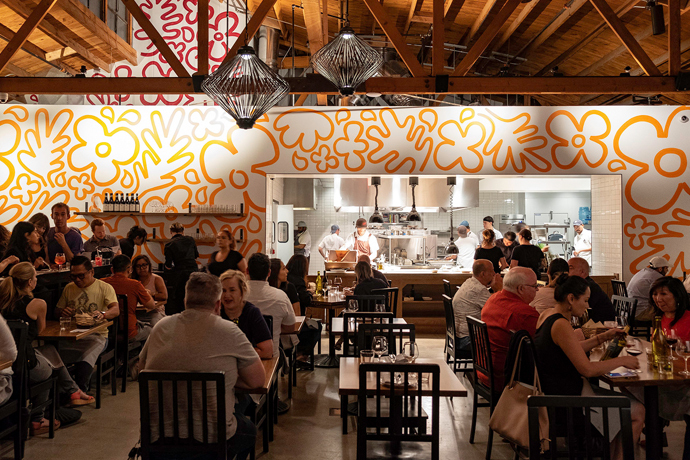 Watch out for the vast courtyard that popped up out of nowhere on La Brea, and that’s your place—it looks like a breakfast factory, all brick and concrete and bare beams inside. The product: iced Cubanos with cinnamon-vanilla milk. Sourdough Belgian waffles with salted maple butter. Oatmeal stout gingerbread loaves. And on and on. Suddenly, your quick little café breakfast has six courses. Which should tide you over until lunch—you’re often in the neighborhood for a quick visit with neighbors like American Rag, Feal Mor and General Quarters, and it’s about time somebody threw a charred-flank-steak sandwich into the mix. The second most important aspect of lunch behind new pants.